Those new to the world of bespoke tailoring can often feel nervous when crossing our threshold for the first time. So, we’ve compiled a concise list of the bespoke essentials, taking you through the order of play for every bespoke suit and shirt consultation. An hour long appointment booked in one of our three locations – Savile Row, The City of London or New York – to discuss your individual requirements with one of our tailors. During this hour your assigned tailor will give you an overview of the bespoke process before establishing what the suit is for – business suit, wedding suit, tweed suit, etc – how often you’ll be wearing it and what sort of style and design you’re after. After establishing how and where your suit will be worn, you will be guided through the cloth selection process. With hundreds of designs, weights and styles to choose from, our fabric ranges are selected from the finest British and Italian cloth makers. It is at this stage where we will discuss things like skin tone and colour preferences. If the suit is for a wedding or special event, we can work with you to accommodate the colour theme and overall style. Deciding the style elements of your suit now follows. Your tailor will help you to determine the details and fit of your suit, working to accentuate your best features and reflect your individual style. Whether double breasted, one or two button, slant or straight pockets, belt loops or braces, all the finer points are covered at this stage of the bespoke essentials. Your measurements are taken and entered into our system. It is from these measurements that we draft your unique bespoke paper pattern for your suits, also keeping it on file for your future orders. 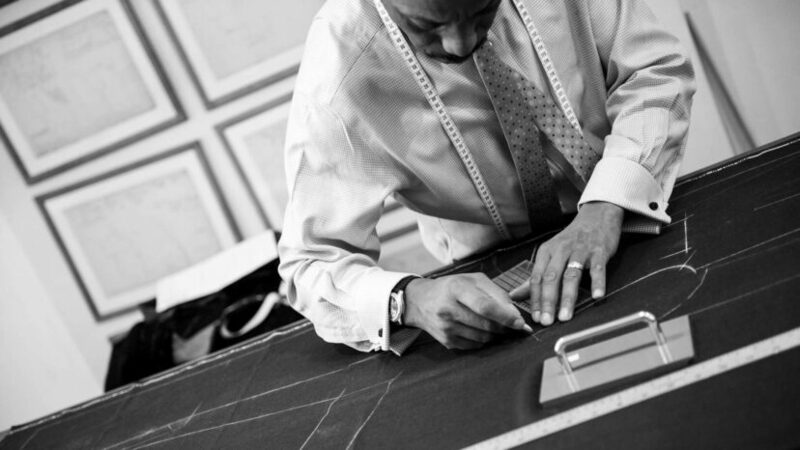 Making your suit comes next, where the craftsmanship that goes into making a Cad & The Dandy bespoke suit really begins. We allocate half an hour as standard for your fitting. Once your suit has been constructed into either a baste, which is standard with the full bespoke construction option, or into its finished state, you will have a fitting or a series of fittings until your suit is the perfect fit.